The Glenair small form-factor 245-805 Mighty Mouse Breakout Board allows fast and reliable monitoring / testing of Unit Under Test (UUT) circuits and contacts during operation. 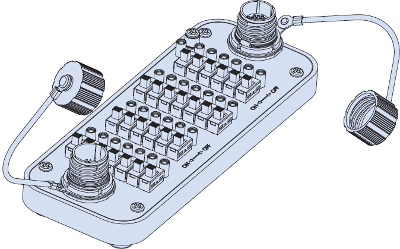 The breakout board, equipped with switch technology instead of fragile plastic jumpers, is inserted between the UUT and the interconnect cable assembly to facilitate accurate debugging of intermittent failures / abnormal transient signals. Each breakout board is supplied with a rugged overmolded cordset that ensures test board durability in both laboratory and on-site testing.